Born in the locality of Lord Street, whose interests he has served in many ways, he was taken to the services at the age of three, and has been associated with that Church ever since. To-day he is a worker par excellence: a steward faithful, a teacher trusted and true, a chorister of great and consecrated gifts, an advocate of total abstinence, a helper of all good causes, a brother beloved. Lord Street has seen much ebb and flow in its time, but Brother Mason has stood by it zealously and hopefully through it all. His most precious treasures to-day are three: a Bible presented to him on becoming a teacher in September, 1869, after being a scholar fourteen years: a “Diploma of Honour,” awarded by the Birmingham Sunday School Union “for continuous and valuable services in the Sunday School cause during forty-one years,” and the memories clustering about his local church. Time has treated him kindly, for, although past the meridian he is vigorous in body, fresh and young in spirit. The Church is to him the “House of God.” He revels in its ministrations. His resources are at its command. His retiring disposition has kept him from being as widely known as he deserves; he makes up for that by concentration. To aid the cause at home has been his first ambition; there he has entirely won the confidence and esteem of all. 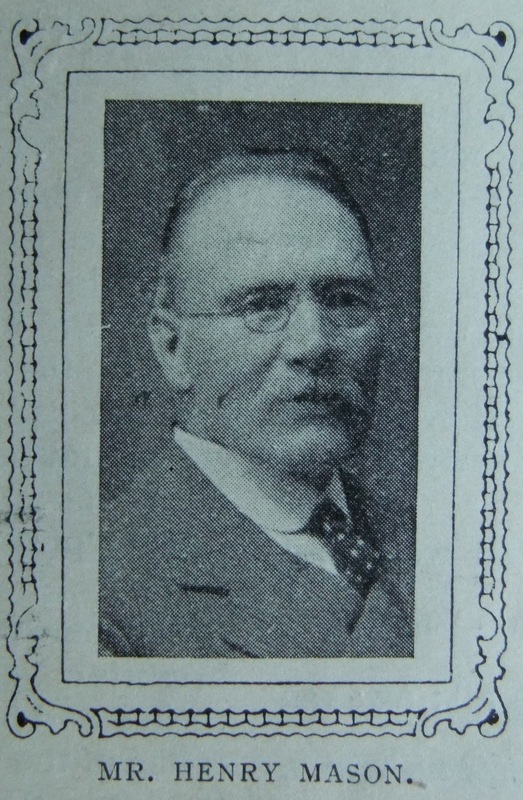 Henry was born in 1852 at Birmingham, Warwickshire, to parents William and Susan. William was a blacksmith. Census returns identify that Henry also worked as a blacksmith, but by the time of the 1891 census he had become an insurance agent. Henry married Charlotte Green (1852-1919) in late 1873 in the Kings Norton Registration District, Worcestershire. They had four children who died in infancy. 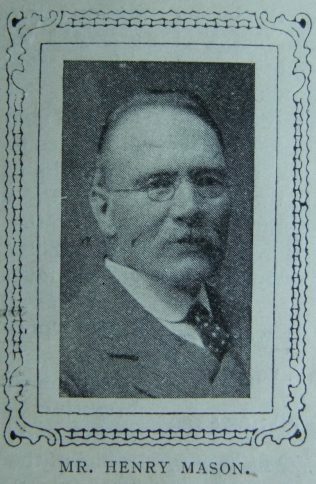 Henry’s death was registered in the third quarter of 1924 in the Dudley Registration District.